The Docklands Stadium, known commercially as the Etihad Stadium, is a multi-purpose stadium in the Docklands area of Melbourne, Australia. 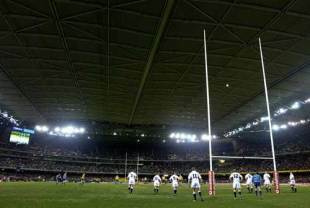 Previously called the Victoria Stadium and then the Colonial Stadium and Telstra Dome, construction was completed in 2000 and the ground hosted its first rugby union international on June 8 that year when Australia beat South Africa 44-23. The impressive stadium also played host to the British & Irish Lions in 2001 with hosts seeing off the tourists 35-14. The crowd of 56,605 people that watched that clash is still the stadium record for a rugby union international. With an official capacity of just over 53,000 it is the second largest rugby union venue in use in Australia behind the ANZ Stadium in Sydney and the only one to have a retractable roof. The ground also hosted seven matches at the 2003 Rugby World Cup including two quarter-finals. Primarily an Aussie Rules venue, the ground is the home of AFL sides Essendon, the Western Bulldogs, St. Kilda, the Kangaroos and Carlton. Originally developed as a replacement for Waverley Park, the stadium has also been host to other sporting events, including football (as home of Melbourne Victory), cricket, rugby league and of course rugby union. Often criticised for the state of the playing surface, stadium officials have recently invested in a multi-million lighting rig to improve grass growth. The Dome, as it is known, is located right on the edge of Melbourne's Central Business District and is situated between North South Rd, Bourke St, Harbour Esplanade and Latrobe St.
A pedestrian bridge from the nearby Southern Cross train station offers easy access to the stadium entrance while local tram and bus routes also offer stops close to the ground. Being so close to the centre of Australia's second most populous city, visitors to the stadium have a wealth of entertainment options at their disposal before and after the game.